Okay, so modern parlance is not my forte, and hip slang references to elaborate teeth are hard to come by. Filing an entire new set of teeth by hand on a saw plate can be a very tedious and slow process. 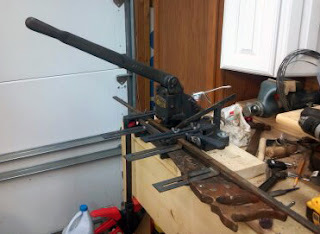 My most recent saw restoration project was a brief reminder of this tedium. This saw required me to file the teeth off of the plate entirely and file new ones in their stead, as the original teeth looked like they came from the mouth of a meth addict chewing limestone bubble gum. Once the right pitch was filed in, sharpening the saw was cake. 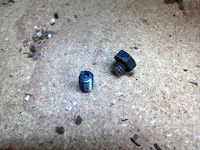 This is why I have been searching the back alleys and speakeasies for a decent mechanical Retoother. Foley or Foley-Belsaw and Burr are of course often the popular answers to this common problem. The problem with these machines is that they are difficult to find intact. They require ratchet and carrier bars which guide the saw through the machine and allow it to cut the appropriate teeth per inch, but the bars are almost never with the machines if the machines even operate in the first place. 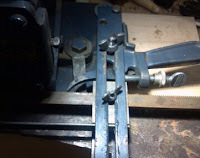 I considered a fly press with a triangular cutter to punch the teeth, and with a little jig I could cut the saw to any pitch required. 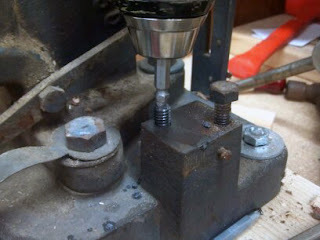 Unfortunately, even a well worn antique fly press lies on the pricey side of the tool kingdom. This is why I was so excited to find a manually operated Foley Retoother with a bunch of ratchet bars for sale in Colorado. Apparently, no one wants the manual machines (why use meat power when electrons do the work?) so they tend to be less expensive. I actually prefer the manual machine as I can pay special attention to each tooth being punched. 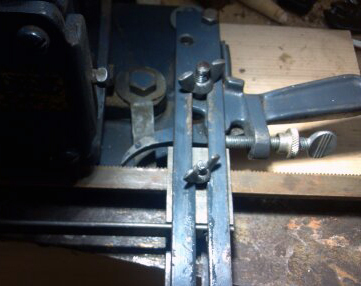 With a little machine work, I can even get this little guy to do progressive pitched saws, although I tend to agree with Mr. Andrew Lunn on the topic of progressive pitch. Additionally, states like Colorado tend to be like time capsules for old tools (and old cars!). The low humidity, altitude, and distance from the sea helps to prevent a majority of rust from forming on even the most neglected tools. 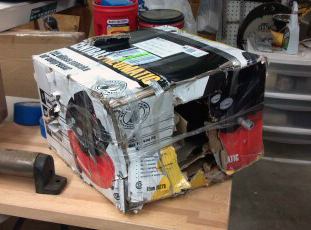 Even the best tool storage methods, however, are often no match for the beatings the United States Postal Service tends to inflict on heavy tools shipped in mere cardboard boxes. So, when the retoother showed up on my doorstep a month or so ago, I was dismayed but not surprised to see a box that looked like it had been wrestled out of the hands of an angry bear. Fortunately, the ratchet bars and cam arm showed up relatively unscathed. Who Took A Bite Out Of My Mail? I have spent the last few nights cleaning and repairing this old hunk of iron, and last night I finally got it to cut some new teeth on an old junk saw. 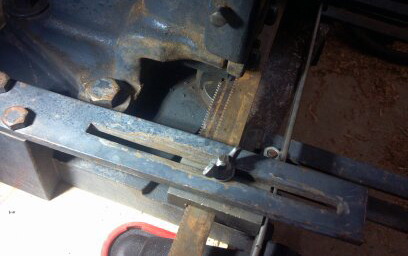 I was planning on needing another night or two to get it operational, but the sheared and broken bolts came out much easier than anticipated and the bent guide bars were an easy fix. I Can't Believe This Extractor Actually Works!! The tool had been stored well, and the light amount of surface rust was cleaned up fairly easily. Even 99% of the original paint was still intact, which usually means that the tool had been lightly used. Once everything was oiled and reassembled I made a trial run. I'll have a full write-up and a short video on its operation soon. My apologies for the poor photos, I wasn't planning on this thing actually working as soon as it did and I wasn't ready with a camera, just armed with a phone. Of course, at this point I was like a child discovering a puppy on Christmas morning. I spent the rest of the evening planning new adventures and possibilities for me and my new pal! I know this is an old post, but I just bought a foley manual retoother with a bunch of ratchet bars on ebay. What model is your foley? I'd appreciate any info you can provide as to using one of these etc. I believe mine is a model A252, but most of the hand operated Foley versions work the same way. I will eventually make a video showing how I operate this thing, but in the meantime I have uploaded an original instruction manual from Foley to the blog. If you follow the link to the page titled "Instruction Manuals" under "Diatribes" on the right side of the screen, and then follow the link to the "Instructions for Foley Saw Filers Manual No. 100" It will take you to the Scribd page where I have uploaded the manual. The hand operated retoother instructions start on page 17. I hope this helps, and again check back from time to time as I'll try to post a video about the retoother soon. Thanks! my retoother arrived today. 60 pounds that the mail lady refused to lug onto the porch (big baby). It looks complete and there are ratchet bars: 8/4.5, 16/8.5, 13/7, 15/8, 11/6, 10/5.5. I can't wait to figure this thing out.